The SERVPRO Disaster Recovery Teams provide help to local franchises when a tornado, hurricane, blizzard or flood disaster strikes. SERVPRO of Virginia Beach has been a part of these storm teams since their inception. We traveled to Alabama after Hurricane Katrina in 2005 and in November 2009 franchises from Pennsylvania came to assist us with claims from a Nor’easter that hit and caused record amounts of flooding in Hampton Roads. In 2011 and 2013, SERVPRO of Virginia Beach assisted with microburst flooding in Northern Virginia. In August of 2016, we expanded our storm teams and dispatched 4 crews to Louisiana to assist with flooding cleanup for 2 weeks. In 2017, we dispatched another 4 crews to Texas for 3 weeks to help after Hurricane Harvey. In the spring and summer of 2018, we went to Maryland, Northern Virginia and Pennsylvania to assist with microbursts and localized flooding events when the job load was too much for the local franchises to handle. Our most recent storm activity was assisting after Hurricane Florence caused devastating damage in North Carolina; we sent 4 crews on September 16th and stayed until January 2019 to complete jobs. Available 24 hours a day and 365 days a year, SERVPRO of Virginia Beach is prepared for the unpredictable and available to travel with any of the 4 storm teams at a moment’s notice. 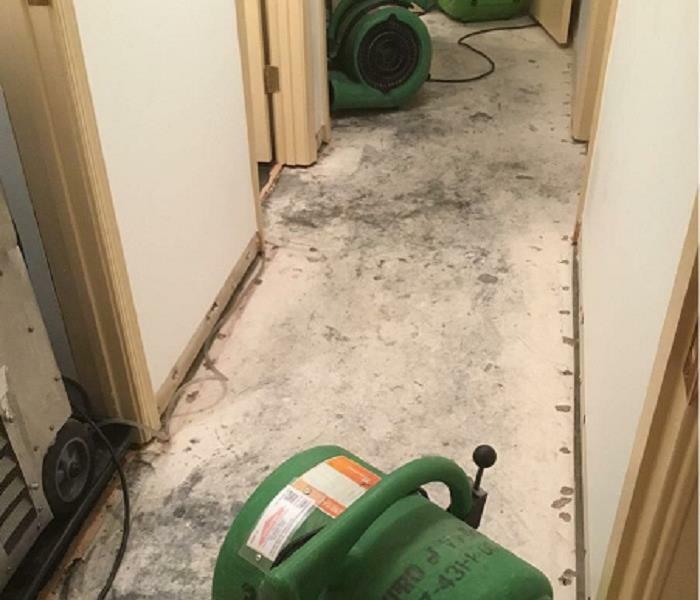 When you call SERVPRO of Virginia Beach to help restore your property after suffering a water damage, our professional technicians will place the appropriate equipment to dry out the area as quickly as possible. It is important to always following our instructions and keep the equipment running at all times. We realize that the equipment is noisy and can become bothersome if you remain in your home during the restoration process, however, turning off the air movers and/or dehumidifiers can delay the drying time and can cause further damage to your property such as mold growth. It is also important to note that oftentimes your insurance coverage will only pay for the drying equipment for a specific length of time, depending on the category of damage. Your SERVPRO of Virginia Beach project manager will monitor the moisture readings of the equipment daily to determine the appropriate time for removal. If you have any concerns or questions about the drying equipment, be sure to speak to any of our crew members. Fire and water damage can not only affect the structure of your property but also your belongings. SERVPRO of Virginia Beach specializes in restoring contents damaged by water, fire, or mold. Our expertise and “restore” versus “replace” mentality can help save you money while preserving precious keepsakes, furnishings and clothing that can’t be replaced. If your home requires extensive restoration or cleaning due to fire damage, SERVPRO of Virginia Beach can conduct an organized, efficient move-out of the affected area. Each item is carefully packed up and transported to our facility for cleaning. We use several methods of cleaning your contents: dry cleaning, used for cleaning light residues or to pre-clean prior to wet cleaning; wet cleaning, an effective cleaning method for removing moderate to heavy residues; spray and wipe, effective for items that can’t withstand wet cleaning; foam cleaning, used for upholstery fabrics that might shrink or bleed if wet cleaned; abrasive cleaning, involves agitation of the surface being cleaned and emersion cleaning, where contents are dipped into a bath of the cleaning product. After cleaning, we meticulously re-wrap the contents in fresh packing material and place them in new boxes, which are stored, until building restoration is completed. As a second-generation owner, Anna has held almost every position within the company since she began working at SERVPRO of Virginia Beach. 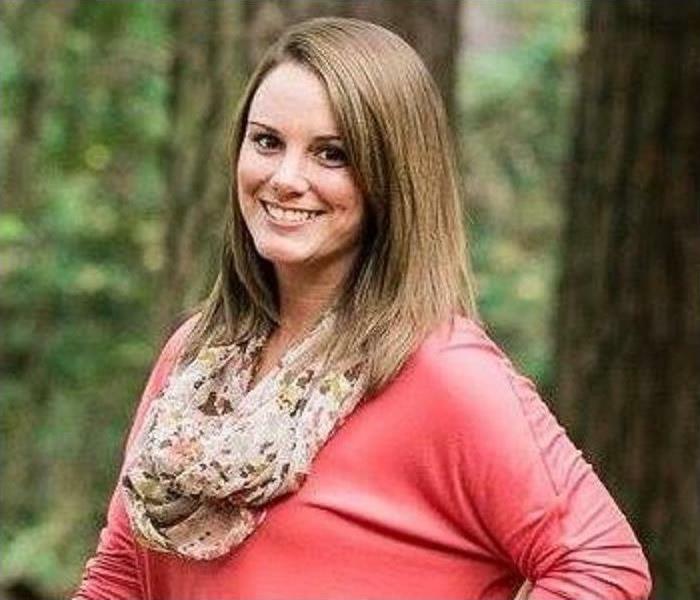 Before SERVPRO, Anna attended Old Dominion University, had a few jobs between high school and college, including managing a couple local tanning salons, while working part time at SERVPRO until 2007, when she came on board full time to learn how to run the business. Anna is currently running the franchise as the General Manager, alongside operations manager, Jason Cheracles, her husband. Together they have grown the business with a wonderful team consisting of their office team (lead by her sister, Katie Anderton and office manager, Lisa Corley); a phenomenal marketing division and amazing production team of extremely hard-working technicians and managers. Anna learned everything show knows from her parents, Bob and Beth Simeone, who started the Virginia Beach franchise in 1991. She has grown up in the business and enjoys seeing how her team helps people each and every day. Anna’s interest is not only on the customers, but on the employees as well. It has been fun for her to see so many people grow into their career and personal lives while they are working with the SERVPRO family. While not working at the office, Anna enjoys spending her time with her husband Jason, and their three children; Ray, Maddox and Charlee. She loves watching her son Maddox play keeper for his Tsunami soccer team, which have been together for the past 4 years, growing from recreational soccer, all the way up to division 1 travel. She also enjoys watching (and listening) to her daughter Charlee play the piano. Her step-son Ray, who just turned 16, keeps her on her toes. She has loved seeing him grow into a young adult during his teenage years. Anna and Jason also have two dogs: an 11-year-old Shih Tzu named Bella (who also serves as the SERVPRO office guard dog) and 3 year old Australian Shepherd, Molly. At the end of the day, Anna loves that her family gets to work together every day. They get to share in each other’s successes and build a company together that truly believes in their mission statement, which is “to develop an accountable team of caring people who are committed to excellence and focus on quality service by being honest, fair and enthusiastic in their work.” By following this mission statement, SERVPRO of Virginia Beach has been able to build an incredible team of individuals that care about the work they do, and the customers that are affected by their actions. part to the additional time it takes them to react and take proper emergency steps to mitigate damage after a loss has occurred. The degree of damage not only increases with the length of time it takes to react, but dollars lost due to business interruptions also increase very rapidly. As many as 50% of businesses may never recover following a disaster, according to the latest industry research. Of the businesses that do survive, many of them had a preparedness plan in place. Pre-planning can serve as an insurance policy aimed at giving you peace of mind. By developing a SERVPRO Emergency Ready Profile for your business, you minimize business interruption by having an immediate plan of action. Knowing what to do, who to call and what to expect in advance is the key to timely mitigation and can help minimize the affects water and fire damage can have on your business. The Benefits are Clear for Virginia Beach Commercial Water Losses! 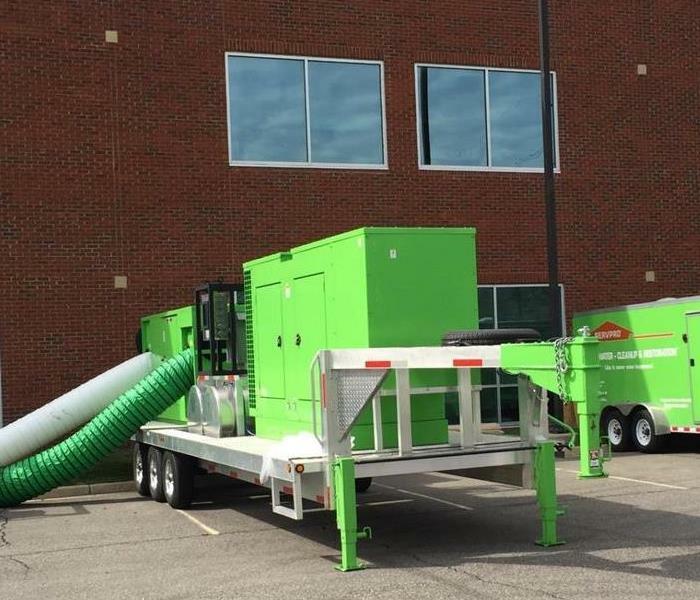 SERVPRO of Virginia Beach is the only restoration contractor in Hampton Roads to own this 5000 CFM drying desiccant, capable of drying a large commercial building, with its own 150kw generator. This state-of-the-art equipment can quickly evaporate humidity to effectively help to dry large areas quickly. 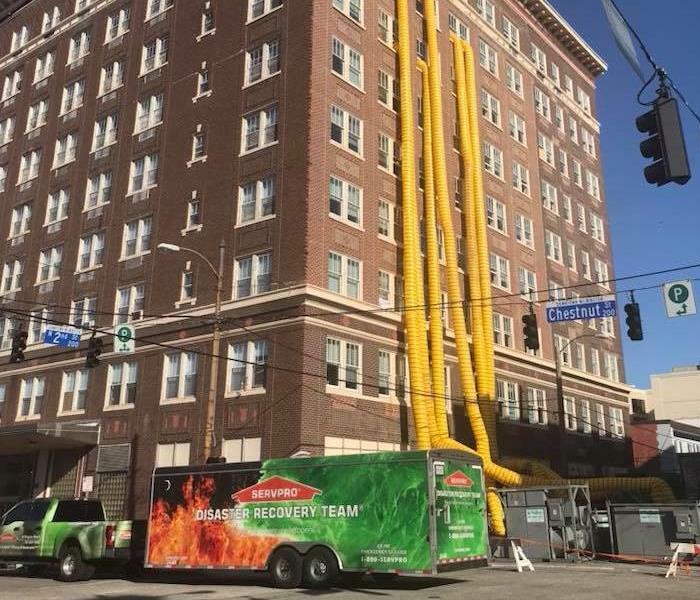 While other area restoration companies must rent this type of machinery, SERVPRO of Virginia Beach has it at the ready. Why is this piece of equipment important to you? Here at SERVPRO of Virginia Beach, our goal is to get your business back up and operational as quickly as possible. The desiccant can move 5000 cubic feet of air per minute, keeping the moisture levels normalized during evaporation. Applications include larger buildings such as schools, hotels, hospitals and commercial buildings requiring more dehumidification, to provide environmental control and restorative drying. For more information and for 24-hour emergency response, contact SERVPRO of Virginia Beach at 757-431-1400. 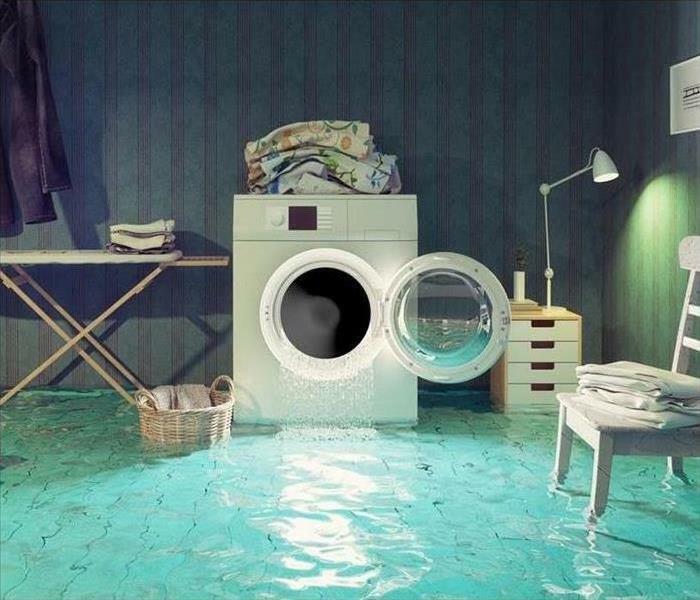 Water damage covers a broad range of potential loss. Homeowners understand that wear and tear will occur in any circumstance; however, there are a variety of unforeseen events that may trigger water damage. Natural disasters are often given the most blame for water damage, and they should, considering that the majority of damages due to water stem from some sort of outside environmental factor. Those homeowners with an understanding of the prospective damages associated with water are much more likely to stop problems before they become major issues. Hopefully these water damage statistics were able to shed some light on the vast complications that may arise from water in the home. If you or your family has experienced water damage and are looking to file a claim, contact Arguello, Hope & Associates for more information. Homeowners must be astute in recognizing water damage as early as possible. When a sudden storm, plumbing issue, or sewer backup occurs, knowing what will be covered will ease stress and make the entire repair process much more fluid. To find out more, contact SERVPRO of Virginia Beach at 757-431-1400. Most violent tornadoes come from supercells, large thunderstorms that have winds already in rotation. About one in a thousand storms becomes a supercell, and one in five or six supercells spawns off a tornado. Tornado season begins in early spring for the states along the Gulf of Mexico. The season follows the jet stream—as it swings farther north, so does tornado activity. May generally has more tornadoes than any other month, but April's twisters are usually more violent. 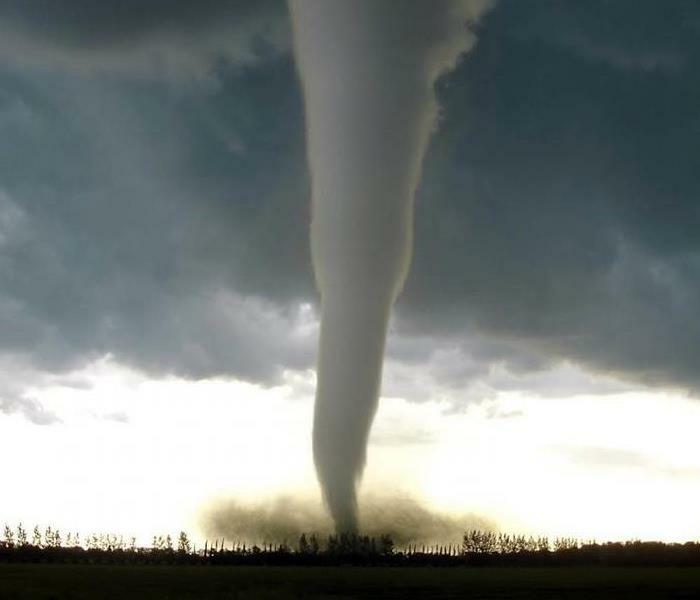 Although they can occur at any time of the day or night, most tornadoes form in the late afternoon. By this time the sun has heated the ground and the atmosphere enough to produce thunderstorms. Tornadoes form when warm, humid air collides with cold, dry air. Twisters are usually accompanied or preceded by severe thunderstorms and high winds. Hail is also common. Once a tornado hits the ground, it may live for as little as a few seconds or as long as three hours. What is a State of Emergency for Hampton Roads: A state of emergency allows state agencies to perform actions, that normally would not be permitted, in the interest of quickly getting assistance to local governments, and in turn Virginia residents. SERVPRO of Virginia Beach is well-versed to handle all Tornado damage in Hampton Roads, 24 hour, 365 days a year emergency for any residential or commercial location in the Hampton Roads area. We have Class “A” Subcontractors standing by and ready to assist in any emergency. We can provide you with one-stop shopping. Leave the hassle of repairing the damage to the Professionals at SERVPRO of Virginia Beach and make it “Like it never even happened.”, call us 757-431-1400 to ensure no further damage occurs to the structure or your contents. SERVPRO of Virginia Beach provides 24 hour, 365 days a year emergency board-up services for any residential or commercial location in the Hampton Roads area. 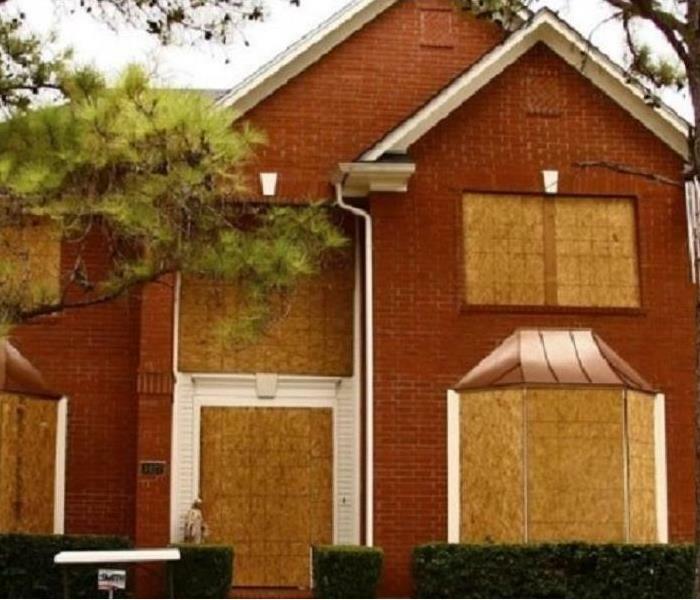 Weather you experience vandalism, storm damage, or another unexpected disaster, you want to restore your property to it’s normal state as soon as it can be done against unauthorized entry. Boarding-up incorrectly can cause additional moisture damages, making the situation even worse. We have Class “A” Subcontractors standing by and ready to assist in any emergency. We can provide you with one-stop shopping. Leave the inconvenience of Board-ups to the Professionals at SERVPRO of Virginia Beach and make it “Like it never even happened.”, call us 757-431-1400 to ensure no further damage occurs to the structure or its contents. We want our customers taken care of in their most vulnerable time of need, that’s why we offer the services that we do: emergency mitigation, fire and water restoration, mold remediation, and so much more. However, one item that often times are overlooked after are our customer’s paper documents and records. SERVPRO of Virginia Beach’s Commercial Large Loss Division (CLLD) offers four services: Vacuum Freeze Drying, Gamma Irradiation, Digitizing, and Certified Destruction. Vacuum Freeze Drying is the most effective way to salvage water damaged documents. The saturated documents are immediately frozen and shipped from the loss site to Corporate where they are dried via sublimation. Sublimation is the process of solid ice converting directly to the gas state bypassing the liquid state. This prevents further damage to the water-logged documents. This process takes between 7-10 days depending on the severity and the number of documents affected. Gamma Irradiation is a process that is used for cleaning/disinfecting and decontaminating documents. In a CAT 3 situation (sewage or flood water), documents are not only deteriorating but are also contaminated with all types of bacteria. Using high-energy photons, the bacteria is killed at the molecular level. There is no fear of residual radiation or contamination, so don’t worry, you won’t turn into the Incredible Hulk. If you want go digital with your records, we can do that too. Drying - process in which an item containing moisture is frozen and dried using vacuums and pressures to achieve sublimation(A process in which a substance is converted directly from a solid to a gas or from a gas to a solid without an intermediate liquid phase.) Note: Damaged documents should be frozen as quickly as possible to stabilize them, and prevent further damage. If you find yourself in need of saving damaged documents, SERVPRO of Virginia Beach and we will make it "Like it never even happened." 2/18/2019 - The Benefits are Clear for Virginia Beach Commercial Water Losses!